Experience for WESTBERRY CBSE High School Secondary Teachers Jobs. 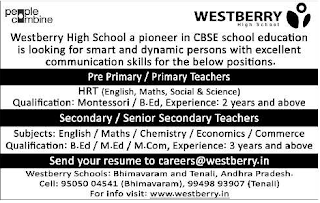 Interested and Eligible candidates can send the resume to Email-d given below for WESTBERRY CBSE High School Primary Teacher/Secondary Teachers Vacancies Notification 2019. 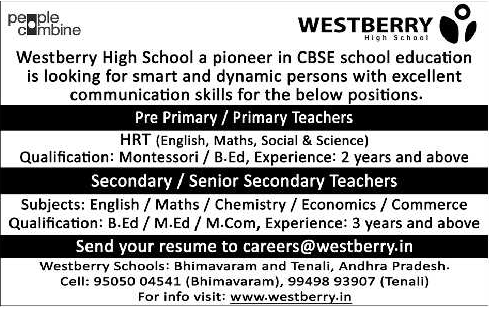 Further details can refer the official website www.westberry.in for WESTBERRY CBSE High School Primary Teacher/Secondary Teachers Posts. Qualification, Email-id, School Address are maintained below. Eligible Candidates can send the resume to Email-d given below for WESTBERRY CBSE High School Primary Teacher/Secondary Teachers Jobs to given school Emai-id .